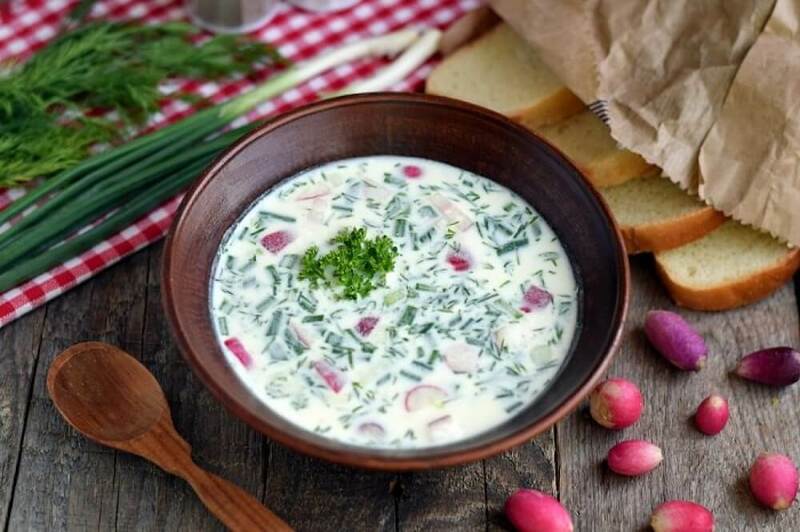 This classic soup is a mix of mostly raw vegetables (like cucumbers, radishes and spring onions), boiled potatoes, eggs, and a cooked meat such as beef, veal or ham with kefir or even water kefir. Okroshka on Kefir with meat (classic recipe) will be good for those who do not like okroshka on water Kefir or whey. I often cook this okroshka because it can be cooked very quickly. The main thing is not to forget that all the products for this dish are cut into the same size and very finely. IMPORTANT: If you boil the potato and eggs in advance, it takes only 15 minutes to prepare the Okroshka! Cut the cucumber into small cubes. The radish is also cut into small cubes, after removing the radish tails and leaves. The spring onions and fresh dill are then chopped very finely. The meat is cooked, and then needs to be cut in small cubes. The boiled then cooled eggs and the potato are cleaned and also cut into small cubes. All the ingredients for Okroshka are now ready. Place all the sliced ​​vegetables, meat and eggs in a bowl and mix well. Pour in the Kefir. Add 250 ml of cold bottled water and squeeze the juice of half a lemon. Salt and black pepper powder is then added, to taste. Mix the ingredients well. If the Okroshka is too thick for you, it is okay to add some more water. The ready-made Okroshka on Kefir with meat (a classic recipe) is poured into serving bowls and served with fresh bread.